We can assume you know what Network Attached Storage or a personal cloud is, or at least the concept behind it. If not, don’t worry. I will explain it in more detail below. There are several options in today’s market and some may just be too expensive or too complicated for your home NAS drive or personal cloud storage. So let’s take a look, what are our network storage options and what are the pros and cons of each different type of NAS drive setup? Basically what is best for you, techie or nontechnical user. Keep in mind that these top picks are compatible with both Windows and Mac user environments. This is the simple solution that I have been using at home for years and I love it. However, it is harder to come by retail because they have released a new upgraded version. The upgraded version has much lower ratings because it must have internet access to work. This is not a huge problem for most users because it is so easy and you simply plug and play it into your router, meaning it will always have internet access at home when attached to your router. But the problem arises, what if the internet goes down? You lose your access until it is back up. So it is not recommended by many. I myself have a problem with this even though I can’t think of a single time my internet was down and if it were I’m not sure why I would need access to my personal cloud. But that’s OK! We have a new awesome solution for a very easy to use home NAS. And with advances in technology, this is the better NAS for you at work or home. 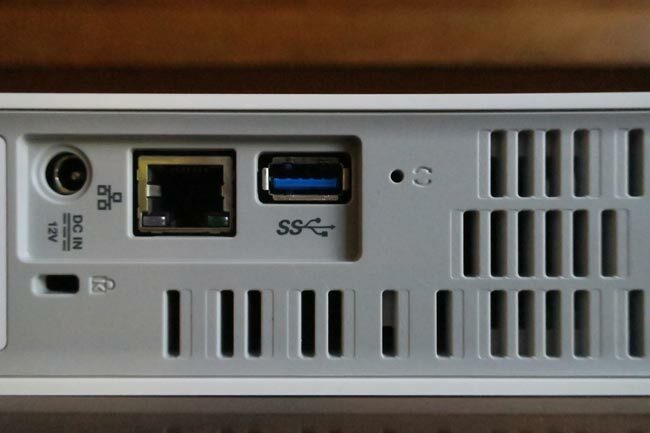 Thankfully there is a new simple solution for home users looking to build a fast and easy NAS. Some people get scared when they hear you must “build it yourself” so to say. But there really is no building, just getting the right parts and snapping them together. Step 1) Buy the NAS Enclosure. This is the workhorse to your home system. It will encase two hard drives for your network storage and make a solid personal cloud. It has a very easy to use interface and is currently the way to go if you want a quick and simple to use NAS for a home network. This enclosure has a beefy 512MB of RAM and a 1.3Ghz Dual Core Processor so that multiple users can easily hammer away at this cloud simultaneously and not even notice a difference in speed performance. Step 2) Buy the NAS Hard Drives. These are the actual inner workings of your Network Storage. You will want two drives of the same size to mirror each other ensuring you absolutely never lose any data. Do you need 2 drives? No, you do not. But as you know the whole purpose of this is to backup all of your files in a way that you never have to worry about losing anything at all. Do it right the first time. Do I need NAS Drives? Yes and no. No, you do not need a NAS specific drive in the sense that any hard drive will work. Yes, you do need a NAS drive in the sense that they are designed to work faster and operate at cooler temperatures as they are on 24/7/365. It’s up to you. If it is just you at home backing stuff up without needing to access it for normal use, a regular hard drive will work. If you are not only backing up but often reading from the drive such as streaming, you will want a NAS ready drive. You can see the differences here. Setup is as easy as this. It’s really that easy. Anyone can do it and have a home network personal cloud in minutes. Note: this is still a super awesome and easy to use NAS if you can find it for a normal price (around $150-$175). But as it is that has become hard to do and the above solution is much much better, but at higher cost. 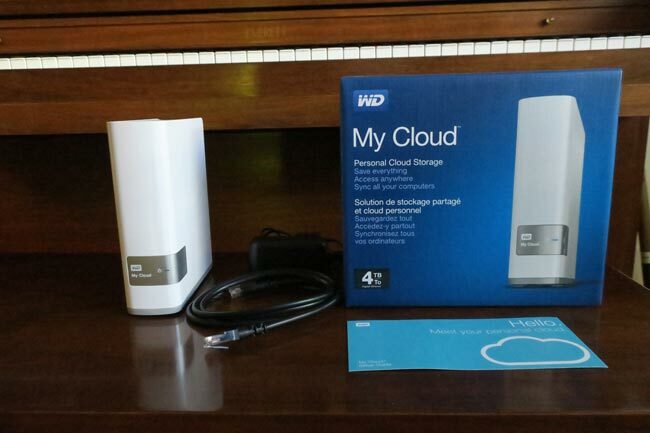 The My Cloud Personal Network Attached Storage is the most simplified easy to set up all in one solution for someone without technical skills or know how. This is ideal for someone who produces or edits large video files and needs to back up their work over the network. Or for the movie / mp3 hoarder. I use it to backup all of my website work and data so that if my computer were to ever crash, it would not matter. As you see the WD My Cloud would be the easiest home NAS solution with it’s simple universal plug and play convenient approach for a personal cloud Network Attached Storage. Unlike professional grade high-end business solutions, it is intuitive and does not require you to be a network engineer to figure out how to set it up. It is as simple as plugging into the existing cat5 Gigabyte Ethernet port on your router as if it were a computer. This device will sit in whatever room your router is in, making it accessible from all computers, phones, security cameras, video game consoles, streaming devices and more on your home network. It really is the best option for a home user. This also means you can access it wirelessly because it is already attached to your wireless routers ethernet port. It lacks business-class features which we will mention in the next option. But of course it is cost effective and a great deal for a budget NAS. And it even has the USB 3.0 Port on the back that allows you to take your existing external drive and plug it in for more network storage. This is great because it makes it so much cheaper to just buy an extra external USB 3.0 hard drive and double your personal cloud storage! The Western Digital My Cloud Application has a sleek browser-based graphical user interface that just about anyone can use, even someone without computer experience. The dashboard is straightforward, has large buttons with clear explanations and detailed instructions. You get an idea from the home screen here. Yes, it is that straightforward. Add users, set up shares, attach devices, all with simple clicks. You can even update the firmware with the click of a button. Even better, they have applications for both Android and iPhones. Yes, that is right, you can manage your home NAS from your phone. Well, I would say the only real con is that it lacks the pro features mentioned in the business class model below such as dual swappable drives for data duplication and the FTP server. 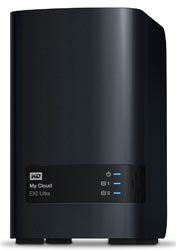 But check the WD My Cloud EX2 below for those options. Also be sure to update your firmware from the get-go(as you should with all hardware) to avoid possible issues. Luckily the upgrade is done with the press of a button. The Western Digital My Cloud EX2 Ultra is just as easy to setup(Plug and Play) as the cheaper My Cloud, but this device steps it up a level for small businesses and serious data protection with options like a dual drive raid array. This is the network storage you need if you want to make sure you never lose any of your precious files. In other words, if you run a business or create content like video and music production. With interchangeable drives, you can keep one back up on a set of drives, swap them out for the second set of hard drives and keep another copy of the backup. What makes this business class and cost so much more? Several things but most importantly the dual hard drives in a raid array for mirrored file duplication and extra data protection. This means that if one drive malfunctions, the data is recoverable via the 2nd mirrored drive where it has been duplicated. Data redundancy is the key here for a business. So you never have to worry about a drive crashing and deleting all of your invaluable information. What else? You can actually hot swap the drives out with another set of hard drives. Why would you do that? It is actually a common practice for many businesses to backup data to a network drive and then swap the disk drives out so that they have dated copies available on hand. Some companies even go as far as to have a service come to pick up those drives, take them to an offsite location and put them in a burn proof safe. This is true data protection. I’ve worked in an environment like this before where it was a college and we had sensitive data that had to be protected at all cost. This was also in San Francisco so if another large earthquake were to hit, the building would crumble and all the data would have been safe off-site. I think you get the point by now. Bottom line, this option allows for hot swapping, has a better CPU, more RAM, more processes, dual drive Raid 1 for true data protection, Active Directory Support for user permissions in a Windows AD environment, built-in FTP server for external access and more. As someone who works with web design and clients, I just love the FTP option because it makes it easy for me to share large quantities of files over the internet with ease. Why Not Setup A Networked Computer For Storage? Most technically inclined people would argue it is cheaper and more cost effective to just set up a whole dedicated computer as an attached network storage server if you need a lot of backup space. I would agree with this because if you really need a lot of storage and flexibility, the network server is the way to go. If you’re looking at 20 terabytes, it would be cheaper. Plus your inner nerd can do other things with this box because it has to always be on. However, this method is a lot more complex and not needed for 95% of home use situations. The other con is you have an extra desktop running at all times. The smaller NAS devices that attach to your router are nearly silent with one hard drive running instead of a whole separate computer system running at all times. Another thing to consider is the power consumption savings with a smaller NAS compared to a desktop station. You really should only build a cheap office computer and throw a lot of extra storage into it if you are a pro at this type of stuff. Otherwise, you’ll end up hiring a network consultant to get you going and there are no savings there. No matter what storage approach you take, you want to easily be able to transfer large files and folders over your network, back up your important data, movies, photos, music and random documents. 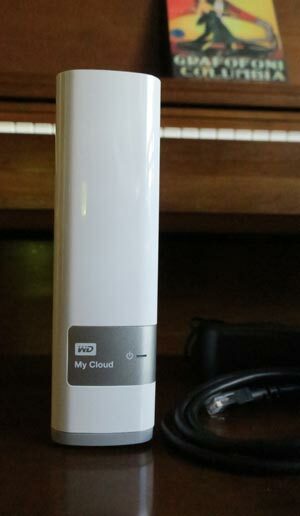 That is what Western Digital has made possible for you with the My Cloud product line. 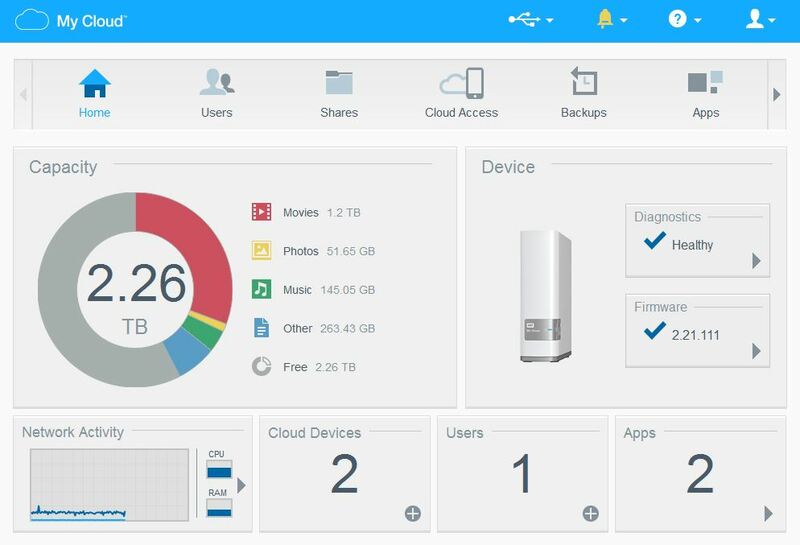 It is a network attached storage simplified.